March 22, 2018 By Allyson 9 Comments This post may contain affiliate links. Read my disclosure policy. 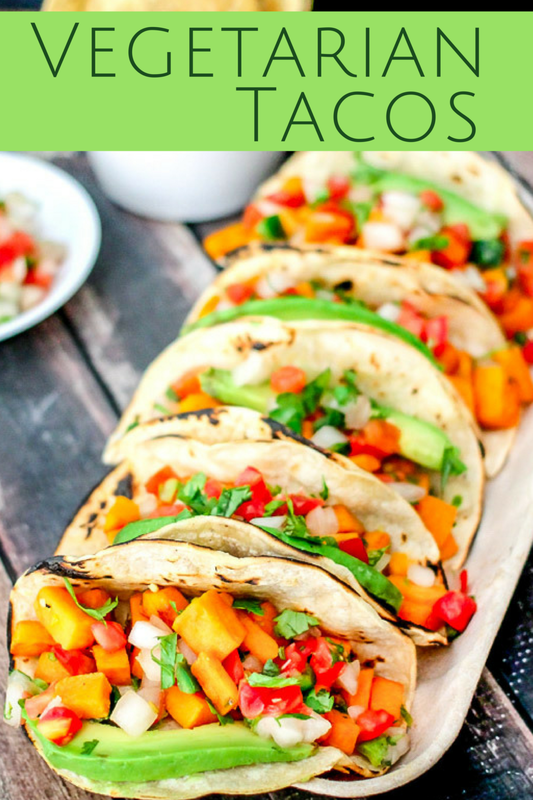 These vegetarian tacos are loaded with fresh sweet potatoes, jalapeno, pico de gallo, and avocado and then wrapped in a warm charred corn tortilla. 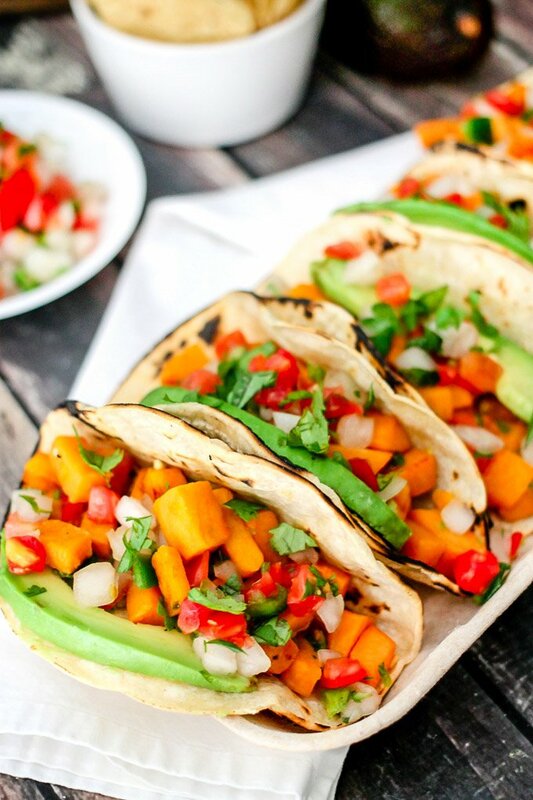 These are the best vegetable tacos! Now that it’s starting to get warmer outside, I love making vegetarian tacos! They make a great dinner or lunch, and you save calories by leaving the meat out. These vegetarian tacos would be great for meatless Monday, taco Tuesday, or a fun get together with friends. Filled with delicious sweet potatoes and avocado, these are sure to be a hit! Today’s post is sponsored by Lava Soap®, but as always all opinions are my own. 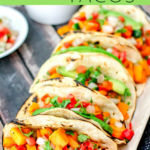 I love making these vegetarian tacos because they are absolutely delicious, but they are also so easy to whip up. They come together in only 25 minutes and you have a healthy dinner for your family or friends. Once all the ingredients are prepped, place a large skillet over medium heat. Add oil, heat for a minute, then add the sweet potatoes and some spices. Cook the sweet potatoes, stirring frequently, for about 7 minutes or until tender. Turn the heat off and add the jalapeno and garlic; stir to combine and heat through. Cut the avocado in half, remove the pit, then slice into thin slices. I like using my avocado slicer. If you have a gas cook top stove, heat your corn tortillas but holding them directly over the open flame, using tongs to hold the tortillas so you don’t get burnt. If you don’t have a gas burner, place the tortillas under the broiler for a minute or 2, watching carefully so they don’t burn. Use Lava soap to clean the sweet potato ‘stain’ from your hands immediately after finishing. I love using Lava Soap to clean my hands because it works so well! It has pumice in the soap which is the key to its effectiveness. Sweet potato stains, jalapeno residue, grease, grime, oil, tar, ink, paint, glue, resins, adhesives, caulk — Lava cleans it all! You can find Lava at most stores, however I typically purchase it off Amazon or at Walmart. 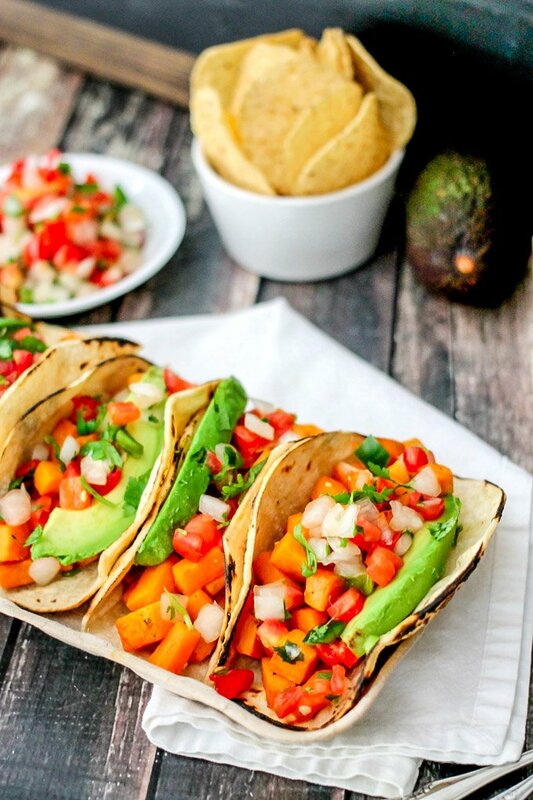 For these vegetarian tacos, you can use homemade or store-bought pico de gallo. I like making it homemade, but feel free to pickup in the produce section of most grocery stores if you are running short on time. Add tomatoes, onion, cilantro, jalapeno, lime juice, garlic, and salt to a small bowl. Stir to combine. Refrigerate at least 20 minutes before serving. 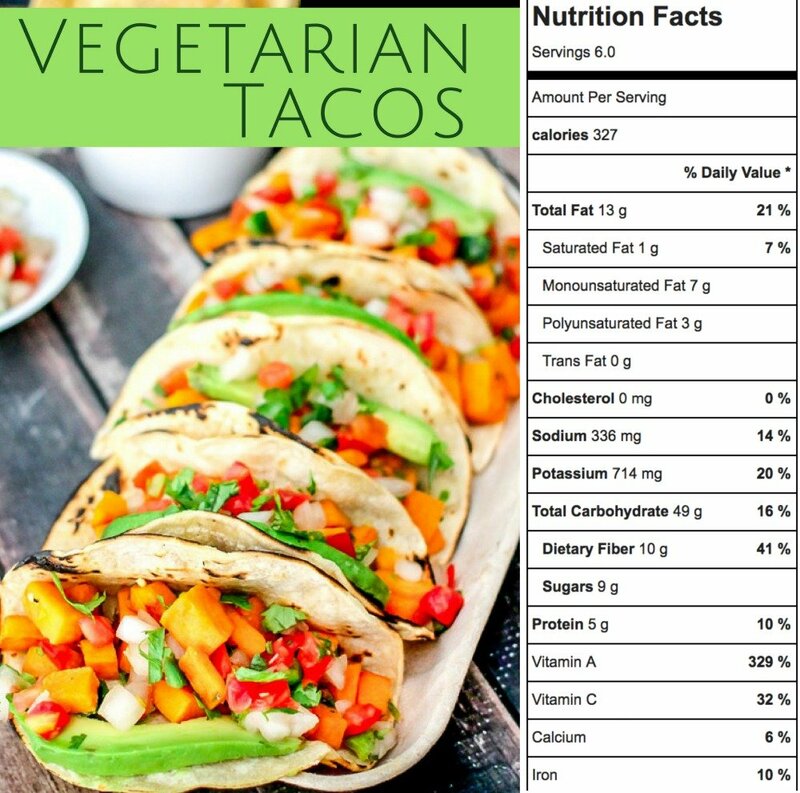 Interesting in switching the ingredients in Vegetarian Tacos? I love the combination of sweet potatoes, jalapeno, and avocados in this version, but you could add a few other things as well. Looking for more protein? Add black beans or tofu to these vegetarian tacos. Want to reduce the carbs? Leave out the sweet potatoes and use chopped zucchini, shredded carrots, and mushrooms in a lower carb version of vegetarian tacos. Not a vegetable, but these tacos would be great for breakfast! Cook up some scrambled eggs and add them to the sweet potato filling for a delicious vegetarian breakfast taco. Mexican Baked Eggs are cooked in one skillet and make a delicious breakfast or dinner! Low calorie and high protein, it’s the perfect healthy meal. Slow Cooker Chicken Tortilla Soup is the perfect healthy comfort food. Set it and forget it; this soup is going to become a regular in your dinner rotation! Mexican Street Corn Salad is a take on the popular Elotes recipe; delicious corn smothered in a spicy dressing and topped with vibrant pops of flavor! This would be great served alongside the vegetarian tacos. In a large skillet over medium high heat, add oil and heat for 1 minute. Add sweet potatoes and saute for 6-8 minutes or until tender. Remove from heat. Add jalapeno, garlic, salt, pepper, and cumin; stir to combine. Set aside. Over a gas burner using tongs to hold each corn tortilla, gently char the tortilla to get a nice burn on it. If you don't have a gas burner, place the tortillas on the rack inside the oven and broil for 1-2 minutes, watching closely so they don't burn. To serve: Top each tortilla with sweet potato mixture, avocado, and pico de gallo. If desired, top with sour cream or Greek yogurt (or serve on side). These look fantastic! I also love the idea of adding some black beans as well! I love homemade pico! And our house is always looking for more vegetarian options! This is a great way to get my kids to eat more veggies without them even realizing it! I am loving these! What a beautiful looking tray of tacos! Can’t wait to dig in! I am concentrating on eating clean and real food. These look perfect! I love how bright and cheerful these are! I can’t wait to try these! Perfect dinner for Meatless Monday… All those fresh colors and flavors! What a great way to transform sweet potatoes! I would devour these tacos. They look absolutely gorgeous! Look delicious and so easy to make! So flavorful!